This article is about the Arabic word "Allah". For the Islamic view of God, see God in Islam. For other uses, see Allah (disambiguation). 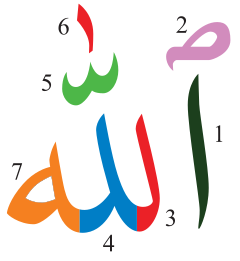 Allah (/ˈælə, ˈɑːlə, əlˈlɑː/; Arabic: الله‎, translit. Allāh, IPA: [ɑɫˈɫɑː(h)] ( listen)) is the Arabic word for God in Abrahamic religions. In the English language, the word generally refers to God in Islam. The word is thought to be derived by contraction from al-ilāh, which means "the god", and is related to El and Elah, the Hebrew and Aramaic words for God. 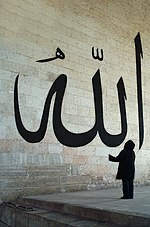 The word Allah has been used by Arabic people of different religions since pre-Islamic times. More specifically, it has been used as a term for God by Muslims (both Arab and non-Arab) and Arab Christians. It is also often, albeit not exclusively, used in this way by Bábists, Bahá'ís, Mandaeans, Indonesian, Malaysian, Maltese Christians, and Mizrahi Jews. Similar usage by Christians and Sikhs in West Malaysia has recently led to political and legal controversies. The etymology of the word Allāh has been discussed extensively by classical Arab philologists. Grammarians of the Basra school regarded it as either formed "spontaneously" (murtajal) or as the definite form of lāh (from the verbal root lyh with the meaning of "lofty" or "hidden"). Others held that it was borrowed from Syriac or Hebrew, but most considered it to be derived from a contraction of the Arabic definite article al- "the" and ilāh "deity, god" to al-lāh meaning "the deity", or "the God". The majority of modern scholars subscribe to the latter theory, and view the loanword hypothesis with skepticism. Cognates of the name "Allāh" exist in other Semitic languages, including Hebrew and Aramaic. The corresponding Aramaic form is Elah (אלה), but its emphatic state is Elaha (אלהא). It is written as ܐܠܗܐ (ʼĔlāhā) in Biblical Aramaic and ܐܲܠܵܗܵܐ (ʼAlâhâ) in Syriac as used by the Assyrian Church, both meaning simply "God". Biblical Hebrew mostly uses the plural (but functional singular) form Elohim (אלהים), but more rarely it also uses the singular form Eloah (אלוהּ). Regional variants of the word Allah occur in both pagan and Christian pre-Islamic inscriptions. Different theories have been proposed regarding the role of Allah in pre-Islamic polytheistic cults. Some authors have suggested that polytheistic Arabs used the name as a reference to a creator god or a supreme deity of their pantheon. The term may have been vague in the Meccan religion. According to one hypothesis, which goes back to Julius Wellhausen, Allah (the supreme deity of the tribal federation around Quraysh) was a designation that consecrated the superiority of Hubal (the supreme deity of Quraysh) over the other gods. However, there is also evidence that Allah and Hubal were two distinct deities. According to that hypothesis, the Kaaba was first consecrated to a supreme deity named Allah and then hosted the pantheon of Quraysh after their conquest of Mecca, about a century before the time of Muhammad. Some inscriptions seem to indicate the use of Allah as a name of a polytheist deity centuries earlier, but we know nothing precise about this use. Some scholars have suggested that Allah may have represented a remote creator god who was gradually eclipsed by more particularized local deities. There is disagreement on whether Allah played a major role in the Meccan religious cult. No iconic representation of Allah is known to have existed. Allah is the only god in Mecca that did not have an idol. Muhammad's father's name was ʿAbd-Allāh meaning "the slave of Allāh". Arab Christians have used two forms of invocations that were affixed to the beginning of their written works. They adopted the Muslim bismillāh, and also created their own Trinitized bismillāh as early as the 8th century. The Muslim bismillāh reads: "In the name of God, the Compassionate, the Merciful." The Trinitized bismillāh reads: "In the name of Father and the Son and the Holy Spirit, One God." The Syriac, Latin and Greek invocations do not have the words "One God" at the end. This addition was made to emphasize the monotheistic aspect of Trinitarian belief and also to make it more palatable to Muslims. According to Marshall Hodgson, it seems that in the pre-Islamic times, some Arab Christians made pilgrimage to the Kaaba, a pagan temple at that time, honoring Allah there as God the Creator. Some archaeological excavation quests have led to the discovery of ancient pre-Islamic inscriptions and tombs made by Arab Christians in the ruins of a church at Umm el-Jimal in Northern Jordan, which contained references to Allah as the proper name of God, and some of the graves contained names such as "Abd Allah" which means "the servant/slave of Allah". A Christian leader named Abd Allah ibn Abu Bakr ibn Muhammad was martyred in Najran in 523, as he had worn a ring that said "Allah is my lord". In an inscription of Christian martyrion dated back to 512, references to Allah can be found in both Arabic and Aramaic, which called him "Allah" and "Alaha", and the inscription starts with the statement "By the Help of Allah". In pre-Islamic Gospels, the name used for God was "Allah", as evidenced by some discovered Arabic versions of the New Testament written by Arab Christians during the pre-Islamic era in Northern and Southern Arabia. Pre-Islamic Arab Christians have been reported to have raised the battle cry "Ya La Ibad Allah" (O slaves of Allah) to invoke each other into battle. 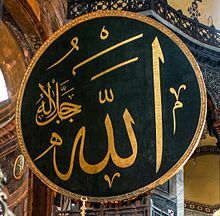 "Allah" was also mentioned in pre-Islamic Christian poems by some Ghassanid and Tanukhid poets in Syria and Northern Arabia. Medallion showing "Allah Jalla Jalaluhu" in the Hagia Sophia, Istanbul, Turkey. Allah script outside the Old Mosque in Edirne, Turkey. In Islam, Allah is the unique, omnipotent and only deity and creator of the universe and is equivalent to God in other Abrahamic religions. According to Islamic belief, Allah is the most common word to represent God, and humble submission to his will, divine ordinances and commandments is the pivot of the Muslim faith. "He is the only God, creator of the universe, and the judge of humankind." "He is unique (wāḥid) and inherently one (aḥad), all-merciful and omnipotent." The Qur'an declares "the reality of Allah, His inaccessible mystery, His various names, and His actions on behalf of His creatures." In Islamic tradition, there are 99 Names of God (al-asmā’ al-ḥusná lit. meaning: 'the best names' or 'the most beautiful names'), each of which evoke a distinct characteristic of Allah. All these names refer to Allah, the supreme and all-comprehensive divine name. Among the 99 names of God, the most famous and most frequent of these names are "the Merciful" (al-Raḥmān) and "the Compassionate" (al-Raḥīm). Most Muslims use the untranslated Arabic phrase in shā’ Allāh (meaning 'if God wills') after references to future events. Muslim discursive piety encourages beginning things with the invocation of bismillāh (meaning 'in the name of God'). There are certain phrases in praise of God that are favored by Muslims, including "Subḥān Allāh" (Holiness be to God), "al-ḥamdu lillāh" (Praise be to God), "lā ilāha illā Allāh" (There is no deity but God) and "Allāhu akbar" (God is greater) as a devotional exercise of remembering God (dhikr). In a Sufi practice known as dhikr Allah (lit. remembrance of God), the Sufi repeats and contemplates on the name Allah or other divine names while controlling his or her breath. According to Gerhard Böwering, in contrast with pre-Islamic Arabian polytheism, God in Islam does not have associates and companions, nor is there any kinship between God and jinn. Pre-Islamic pagan Arabs believed in a blind, powerful, inexorable and insensible fate over which man had no control. This was replaced with the Islamic notion of a powerful but provident and merciful God. According to Francis Edward Peters, "The Qur’ān insists, Muslims believe, and historians affirm that Muhammad and his followers worship the same God as the Jews (29:46). The Qur’an's Allah is the same Creator God who covenanted with Abraham". Peters states that the Qur'an portrays Allah as both more powerful and more remote than Yahweh, and as a universal deity, unlike Yahweh who closely follows Israelites. In order to pronounce the word Allah correctly, one has to focus on the second “l” (ل) in Allah (الله). When the word Allah is preceded by the vowel “a” (فَتْحة) or the vowel “u” (ضَمّة), then the Lām is pronounced in a distinct heavy manner – with Tafkhīm. This heavy Lām is thus articulated with the entire body of the tongue rather than its tip alone. For example, verse 58:22: “man haddaAllah” (ِمَنْ حَادَّ الله) which means: those who oppose Allah. If, however, the preceding vowel is “i” (كَسْرة), then the Lām in Allah is light, such as in the Basmala: Bismillahi... (ِبِسْمِ الله الرَّحْمٰنِ الرَّحِيمِ). So when saying “Bismillahi”, the Lām should not be pronounced with a heavy emphasis – instead, just with the tip of the tongue. The history of the name Allāh in English was probably influenced by the study of comparative religion in the 19th century; for example, Thomas Carlyle (1840) sometimes used the term Allah but without any implication that Allah was anything different from God. However, in his biography of Muḥammad (1934), Tor Andræ always used the term Allah, though he allows that this "conception of God" seems to imply that it is different from that of the Jewish and Christian theologies. Languages which may not commonly use the term Allah to denote God may still contain popular expressions which use the word. For example, because of the centuries long Muslim presence in the Iberian Peninsula, the word ojalá in the Spanish language and oxalá in the Portuguese language exist today, borrowed from Arabic inshalla (Arabic: إن شاء الله). This phrase literally means 'if God wills' (in the sense of "I hope so"). The German poet Mahlmann used the form "Allah" as the title of a poem about the ultimate deity, though it is unclear how much Islamic thought he intended to convey. Some Muslims leave the name "Allāh" untranslated in English, rather than using the English translation "God". The word has also been applied to certain living human beings as personifications of the term and concept. 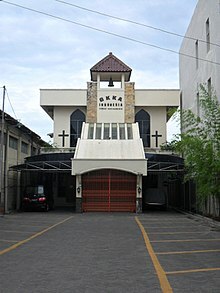 The first dictionary of Dutch-Malay by A.C. Ruyl, Justus Heurnius, and Caspar Wiltens in 1650 recorded "Allah" as the translation of the Dutch word "Godt"
Gereja Kalam Kebangunan Allah (Word of God Revival Church) in Indonesia. Allah is the word for "God" in the Indonesian language - even in Alkitab (Christian Bible, from الكتاب al-kitāb = the book) translations, while Tuhan is the word for "Lord". Christians in Malaysia also use the word Allah for "God". 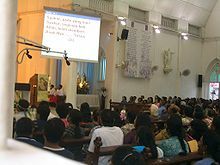 Christians in Malaysia and Indonesia use Allah to refer to God in the Malaysian and Indonesian languages (both of them standardized forms of the Malay language). Mainstream Bible translations in the language use Allah as the translation of Hebrew Elohim (translated in English Bibles as "God"). This goes back to early translation work by Francis Xavier in the 16th century. The first dictionary of Dutch-Malay by Albert Cornelius Ruyl, Justus Heurnius, and Caspar Wiltens in 1650 (revised edition from 1623 edition and 1631 Latin edition) recorded "Allah" as the translation of the Dutch word "Godt". Ruyl also translated the Gospel of Matthew in 1612 into the Malay language (an early Bible translation into a non-European language, made a year after the publication of the King James Version), which was printed in the Netherlands in 1629. Then he translated the Gospel of Mark, published in 1638. The government of Malaysia in 2007 outlawed usage of the term Allah in any other but Muslim contexts, but the Malayan High Court in 2009 revoked the law, ruling it unconstitutional. While Allah had been used for the Christian God in Malay for more than four centuries, the contemporary controversy was triggered by usage of Allah by the Roman Catholic newspaper The Herald. The government appealed the court ruling, and the High Court suspended implementation of its verdict until the hearing of the appeal. In October 2013 the court ruled in favor of the government's ban. In early 2014 the Malaysian government confiscated more than 300 bibles for using the word to refer to the Christian God in Peninsular Malaysia. However, the use of Allah is not prohibited in the two Malaysian states of Sabah and Sarawak. The main reason it is not prohibited in these two states is that usage has been long-established and local Alkitab (Bibles) have been widely distributed freely in East Malaysia without restrictions for years. Both states also do not have similar Islamic laws as those in West Malaysia. In reaction to some media criticism, the Malaysian government has introduced a "10-point solution" to avoid confusion and misleading information. The 10-point solution is in line with the spirit of the 18- and 20-point agreements of Sarawak and Sabah. Allāh in other languages that use Arabic script is spelled in the same way. This includes Urdu, Persian/Dari, Uyghur among others. The word Allah written in different writing systems. The word Allāh is always written without an alif to spell the ā vowel. This is because the spelling was settled before Arabic spelling started habitually using alif to spell ā. However, in vocalized spelling, a small diacritic alif is added on top of the shaddah to indicate the pronunciation. الاه: This reading would be Allāh spelled phonetically with alif for the ā. الإله: This reading would be al-Ilāh = 'the god' (an older form, without contraction), by older spelling practice without alif for ā. Many Arabic type fonts feature special ligatures for Allah. Unicode has a code point reserved for Allāh, ﷲ = U+FDF2, in the Arabic Presentation Forms-A block, which exists solely for "compatibility with some older, legacy character sets that encoded presentation forms directly"; this is discouraged for new text. Instead, the word Allāh should be represented by its individual Arabic letters, while modern font technologies will render the desired ligature. The calligraphic variant of the word used as the Coat of arms of Iran is encoded in Unicode, in the Miscellaneous Symbols range, at code point U+262B (☫). ^ "Allah". Random House Webster's Unabridged Dictionary. ^ "Allah - definition of Allah in English from the Oxford dictionary". oxforddictionaries.com. ^ "God". Islam: Empire of Faith. PBS. Archived from the original on 2014-03-27. Retrieved 18 December 2010. ^ Gardet, L. "Allah". In Bearman, P.; Bianquis, Th. ; Bosworth, C.E. ; van Donzel, E.; Heinrichs, W.P. Encyclopaedia of Islam Online. Brill Online. Retrieved 2 May 2007. ^ Zeki Saritoprak (2006). "Allah". In Oliver Leaman. The Qur'an: An Encyclopedia. Routledge. p. 34. ^ Vincent J. Cornell (2005). "God: God in Islam". In Lindsay Jones. Encyclopedia of Religion. 5 (2nd ed.). MacMillan Reference USA. p. 724. ^ a b c d e f Christian Julien Robin (2012). Arabia and Ethiopia. In The Oxford Handbook of Late Antiquity. OUP USA. pp. 304–305. ISBN 9780195336931. ^ Merriam-Webster. "Allah". Merriam-Webster. Archived from the original on 2014-04-20. Retrieved 25 February 2012. ^ Sikhs target of 'Allah' attack, Julia Zappei, 14 January 2010, The New Zealand Herald. Accessed on line 15 January 2014. ^ Malaysia court rules non-Muslims can't use 'Allah', 14 October 2013, The New Zealand Herald. Accessed on line 15 January 2014. ^ a b c Idris Jala (24 February 2014). "The 'Allah'/Bible issue, 10-point solution is key to managing the polarity". The Star. Retrieved 25 June 2014. ^ a b c D.B. Macdonald. Encyclopedia of Islam, 2nd ed, Brill. "Ilah", Vol. 3, p. 1093. ^ Columbia Encyclopaedia says: Derived from an old Semitic root referring to the Divine and used in the Canaanite El, the Mesopotamian ilu, and the biblical Elohim and Eloah, the word Allah is used by all Arabic-speaking Muslims, Christians, Jews, and other monotheists. ^ Hitti, Philip Khouri (1970). History of the Arabs. Palgrave Macmillan. pp. 100–101. ^ a b Jonathan Porter Berkey (2003). The Formation of Islam: Religion and Society in the Near East, 600-1800. Cambridge University Press. p. 42. ISBN 978-0-521-58813-3. ^ Daniel C. Peterson (26 February 2007). Muhammad, Prophet of God. Wm. B. Eerdmans Publishing. p. 21. ISBN 978-0-8028-0754-0. ^ a b Francis E. Peters (1994). Muhammad and the Origins of Islam. SUNY Press. p. 107. ISBN 978-0-7914-1875-8. ^ Irving M. Zeitlin (19 March 2007). The Historical Muhammad. Polity. p. 33. ISBN 978-0-7456-3999-4. ^ "Allah." In The Oxford Dictionary of Islam. Ed. John L. Esposito. Oxford Islamic Studies Online. 01-Jan-2019. <http://www.oxfordislamicstudies.com/article/opr/t125/e128>. ^ Lewis, Bernard; Holt, P. M.; Holt, Peter R.; Lambton, Ann Katherine Swynford (1977). The Cambridge history of Islam. Cambridge, Eng: University Press. p. 32. ISBN 978-0-521-29135-4. ^ Alfred Guillaume& Muhammad Ibn Ishaq, (2002 ). The Life of Muhammad: A Translation of Isḥāq's Sīrat Rasūl Allāh with Introduction and Notes. Karachi and New York: Oxford University Press, page 18. ^ Irfan Shahîd, Byzantium and the Arabs in the Fourth Century, Dumbarton Oaks Trustees for Harvard University-Washington DC, page 418. ^ a b Böwering, Gerhard, God and His Attributes, Encyclopaedia of the Qurʼān, Brill, 2007. ^ a b Bentley, David (September 1999). The 99 Beautiful Names for God for All the People of the Book. William Carey Library. ISBN 978-0-87808-299-5. ^ Murata, Sachiko (1992). The Tao of Islam : a sourcebook on gender relationships in Islamic thought. Albany NY USA: SUNY. ISBN 978-0-7914-0914-5. ^ a b "How do you pronounce "Allah" (الله) correctly?". ARABIC for NERDS. 2018-06-16. Retrieved 2018-06-16. ^ "Surah Al-Mujadila [58:22]". Surah Al-Mujadila [58:22]. Retrieved 2018-06-16. ^ "A history of Clarence 13X and the Five Percenters, referring to Clarence Smith as Allah". Finalcall.com. Archived from the original on 2013-10-22. Retrieved 2014-01-14. ^ Justus Heurnius, Albert Ruyl, Caspar Wiltens. "Vocabularium ofte Woordenboeck nae ordre van den alphabeth, in 't Duytsch en Maleys". 1650:65. Books.google.co.id. 1650. Archived from the original on 2013-10-22. Retrieved 2014-01-14. ^ But compare: Milkias, Paulos (2011). "Ge'ez Literature (Religious)". Ethiopia. Africa in Focus. Santa Barbara, California: ABC-CLIO. p. 299. ISBN 9781598842579. Retrieved 2018-02-15. Monasticism played a key role in the Ethiopian literary movement. The Bible was translated during the time of the Nine Saints in the early sixth century [...]. ^ Barton, John (2002–12). The Biblical World, Oxford, UK: Routledge. ISBN 978-0-415-27574-3. ^ North, Eric McCoy; Eugene Albert Nida ((2nd Edition) 1972). The Book of a Thousand Tongues, London: United Bible Societies. ^ "Encyclopædia Britannica: Albert Cornelius Ruyl". Britannica.com. Archived from the original on 2013-10-19. Retrieved 2014-01-14. ^ Roughneen, Simon (14 October 2013). "No more 'Allah' for Christians, Malaysian court says". The Christian Science Monitor. Retrieved 14 October 2013. ^ "BBC News - More than 300 Bibles are confiscated in Malaysia". BBC. 2 January 2014. Archived from the original on 25 January 2014. Retrieved 14 January 2014. ^ a b "Catholic priest should respect court: Mahathir". Daily Express. 9 January 2014. Archived from the original on 10 January 2014. Retrieved 10 January 2014. ^ Jane Moh; Peter Sibon (29 March 2014). "Worship without hindrance". The Borneo Post. Archived from the original on 29 March 2014. Retrieved 29 March 2014. ^ "Bahasa Malaysia Bibles: The Cabinet's 10-point solution". ^ "Najib: 10-point resolution on Allah issue subject to Federal, state laws". The Star. 24 January 2014. Retrieved 25 June 2014. ^ Kees Versteegh; Mushira Eid (2005). Encyclopedia of Arabic Language and Linguistics: A-Ed. Brill. pp. 379–. ISBN 978-90-04-14473-6. ^ "Zebed Inscription: A Pre-Islamic Trilingual Inscription In Greek, Syriac & Arabic From 512 CE". Islamic Awareness. 17 March 2005. Archived from the original on 2013-10-13. ^ "''Unicode Standard 5.0'', p.479, 492" (PDF). Archived from the original (PDF) on 2014-04-28. Retrieved 2014-01-14.